When you are feeling introspective, reflective, re-living moments of your life that might be objectionable, full of adventure or daring, do you ever feel that the person you are today is a totally different person than the one who had those experiences in the past? You know it was you who lived those moments, but now, let's say some 10, 15-odd years later you are older and wiser, you are more content with how things are. You are less inclined to mess with a "good thing" and risk danger in order to find your proverbial "heart's desire" located "somewhere over the rainbow." "witty and wise, sometimes foolish, always real and often hilarious. Doo Doo Cat is the best traveling companion you'll ever have. He promises to take you so deep in the the soul of a cat you'll feel yourself purr." "Doo Doo tells his story in his own voice, we see what he sees, feel what he feels. His adventures will seize your imagination and touch your heart in ways you never thought possible, because you're not a cat. But Doo Doo is. And he promises to take you so deep inside his soul you'll feel yourself purr." Doo Doo embarks on a 6000 mile odyssey where he meets characters who to me, were again reminiscent of characters in The Wizard Of Oz. There is Kathy, (aka The Good Witch Glinda), Edgar (one of the wicked witches of the west), Charlie and his "rickety airplane" (the Wizard and his hot air balloon), Rass (Toto) and a host of others who are all instrumental in helping Doo Doo to define not only who he is, but who he will become as a result of his arduous journey. In The Wizard Of Oz, Dorothy's journey began as a result of a cyclone. In The Confessions of a Catnip Junkie, " Doo Doo's adventure is blamed on the effects of catnip. The intoxicating, sheer bliss inducing, seductive and "I'm-not-responsible-for-what-I-might-do" effects of catnip. Could my interpretation of this book be the result of MY past, succumbing to the seductive scent of bagged greenery with effects akin to catnip? I'll never tell, that was a long time ago and like Doo Doo, I am a different person now than I was then. In reality it is being young that causes wanderlust. Whether it be an orange tabby or a young adult experiencing these "coming of age" feelings, those of us who are of a "certain age" can relate. Youth often brings cocky confidence, the contradiction of wanting to be loved by our parents yet rebelling against them. Being young often brings with it a longing to spread one's wings, to be free of physical constraints, to assert ourselves, experience life for ourselves, to fall and pick-ourselves-up by using survival skills we learn along the way. When we are young we often practice "loving and leaving" when things become too intense and claustrophobic for our liking. We resist the safety of the familial cocoon. We fail to realize that we really are attached to the cocoon by a thread which never unravels but gently tugs at our hearts reminding us, leading us back to what we had all along. The safety and security of home. Doo Doo's adventure made him become "very lost, but not so lost that he doesn't know what he wants more than anything. It's the same thing we all want-- love and home --"
Ultimately there is "no place like home". Sound familiar? MY OPINION OF THIS BOOK: It is now one of my favorites. I read it in one night beginning at around 7:30pm and as author/blogger extraordinaire Ingrid King said in her review of this book, I, too COULD NOT PUT IT DOWN. That isn't the norm for me. I tend to have a short attention span. Not in reference to this book. I read it until I finished it, at about 1:30 am. It IS THAT GOOD. It is full of suspense, humor, action, adventure and warm fuzzies. Goldstein does a superb job of taking "everything that makes a cat, a cat" from its movements, fears, habits, likes, dislikes, talents and thoughts (if we REALLY know what cats think), and conveys them through words that reflect an inherent understanding of the feline that is unsurpassed by many. ABOUT THE AUTHOR: Allan Goldstein lives in San Francisco with his wife, Jordan, and a minimum of two cats. He also blogs regularly on opednews.com, and on hypocrisy.com under the pseudonym Snark Twain. He is currently at work on his third novel. You can read most of his published writing on his website, allangoldstein.com. Want to know about Doo Doo? When you purchase this book (and you SHOULD) be sure to read the "About The Author" section in the back, but not until you have FINISHED the book! 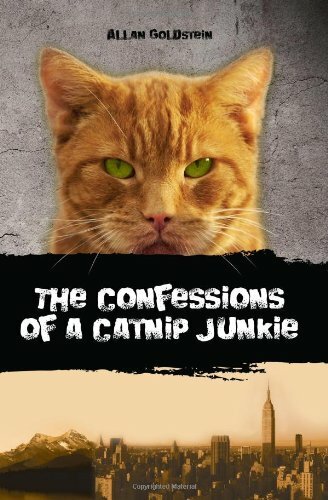 The Confessions Of A Catnip Junkie is available on Amazon.com both in the Kindle Edition and in paper back. I was not compensated for this review. I was sent The Confessions Of A Catnip Junkie to read/review. All opinions are my own. Wow, sounds like a fantastic book for sure! Hope you had a good weekend Cody & Caren! Hi Handsome Clooney, it most certainly is and I did!! Hope you did too! Great review and that sounds like a super book. One can never really have too many cat books. And by one, I mean me of course, MOL. @Julia thanks! I honestly couldn't put it down and I am telling you that isn't like me at all! It is fabulous! I hear you about not having too many cat books, I am right with you! Doo Doo Cat reminds me of me....remember my one week away from home escapade? purrr....meow! @Cat From Sydney OMG you are right! lol. I love it! Hmmmm...was yours a "catnip induced" journey? I like your beginning of your postm Caren. The first paragraph really made me think and try to recall those moments and I've to admit that what you've said is really true to my heart. I've read an article about a month ago. It was written by a renowned Taiwanese monk, he said there is only one word to describe we human beings. 'SEEKING' is the word, we are doing it throughout our life. We're always looking for something, once we've found it, we start to look for another one. The cycles keep going and we keep doing the same thing, but at the same time, we ignore or miss what we have at the present, those present moments are indeed the precious things that we are having. Then we mourn when we lose it. Thanks for reminding me the story of The Wizard of Oz too. I'll definitely look for this book. I read - and reviewed - the book for my blog and I loved it just as much as you did! It is a pawsome book and I loved how well-drawn all the characters were, both feline and human. Awww sounds like a most profound book!! Doo doo cat! What a name - love it! Gosh I cannot believe how I was 20-25 years ago! Youth truly does make you feel invincible! Oh but I'd never ever want to return there! I'm home now! I loved this book. I never thought I'd find a cat book I couldn't put down, but this one reads more like a suspense novel than a cat book! dArtagnan Rumblepurr/Diego Hamlet Moonfur it is fantastic! @Ingrid King I felt the same (you saw I referenced you, right?) It is rare indeed for me to find a book that I can't put down...haven't found one in a long time, til this one! @Old Kitty I am with you, when I think back...OMG!! You will totally love Doo Doo's personality as well! @Sparkle yes and the way he captures everything about cats...it is as if the cats are human, actually, BETTER than human! @Mr Puddy your Mom will love it! Ohhhhh she will ADORE Doo Doo's personality, he just might remind her of YOU! @Priscilla, your summation of "SEEKING" is totally on the money, so true...we all eventually must come full circle, some repeat the cycle over and over again as you said. Sounds like our cup of catnip tea. I love the cover and title of this book and your review makes me want to read it even more. This one will be on my shelf very soon! My mom has a good furiend who luvs kittehs, I will let mom know 'bout dis book, cuz I think it would make a nice Christmas gift. PeeS Thanks fur welcoming Max to Blogville! oh, now we are very curious about this book! Seems our book list is getting long- we need to get reading, mol! @Cats of Wildcat Woods, it is! @Maggie i am sure your kitty friend would LOVE this book! Awww you are welcome! I am pleased to meet Max! @Avalon THANK YOU! your comment made my night. I truly appreciate it! @Layla, I am telling you, you will LOVE IT! Wow! What glowing reviews! This book sounds like a must read for me and I am so glad to have heard about it here. It's time to get back to the simplier joys in life - like reading a good book!